Even though Acer is widely known in the gaming industry for its beefy Predator lineup, their Nitro series has recently also been catching some heat. The Nitro notebooks are ideal for casual gamers or those looking for a decent portable gaming machine to augment their desktop rigs. And Acer doubled down on this segment with new Nitro desktop PCs at the [email protected] event last night. Firstly, let’s talk about the new Nitro 50 series desktop PC, which sports a stunning 4K resolution monitor but also packs support for up to four displays. This chassis sports aptly aggressive design – not over the top, but you can’t mistake this thing for anything other than a gaming desktop. The angular armor-inspired front has red LED lighting. These desktops are powered by latest 8th-gen Intel Core processors with three options available – i3-8100, i5-8400, and i7-8700. There’s also up to 64GB of dual-channel DDR4 RAM and up to 32GB of Intel optane memory, coupled with up to 3TB of HDD or up to 512GB SSD drive. As for the graphics cards, Acer gives you a choice between Nvidia and AMD. You can pick from the GeForce GTX 1050, 1050Ti, 1060 or 1070 GPU, or AMD’s Radeon RX580 and RX580X cards. All of this is topped off by the Realtek Dragon LAN card for optimized network speeds for streaming and an optional Qi wireless charging pad. 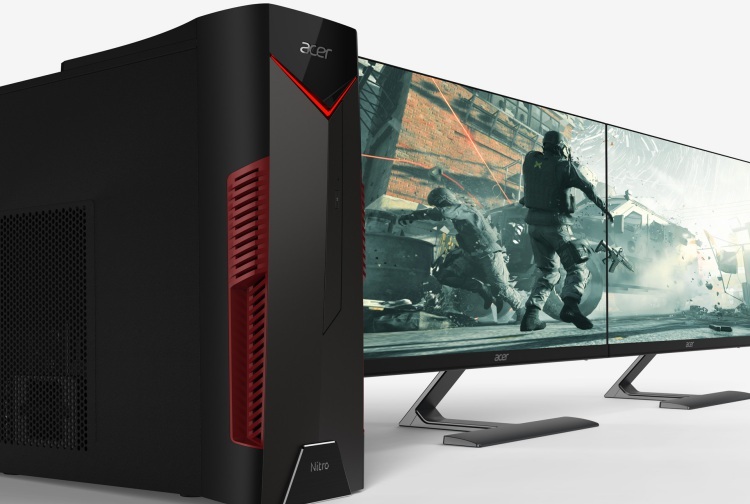 The Acer Nitro 50 gaming desktops will be available in Europe, Middle East and Africa later this month, starting at 999 euros. They will also make their way to the US in July, starting at $799. Moving on to the new monitors, Acer has unveiled two new series of Nitro monitors namely VG0 and RG0 for you to choose from. 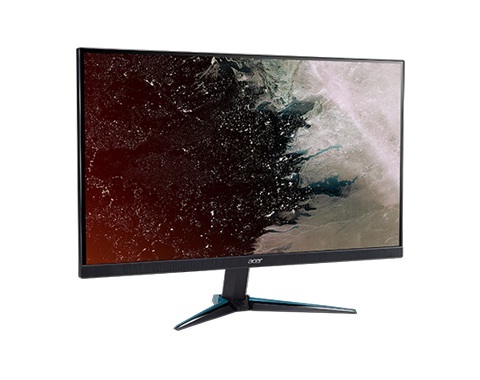 The Nitro VG0 monitors are available in 3 different size and resolution configurations, including 21.5-inch Full HD (1080p), 23.8-inch QHD (1440p), and 27-inch 4K (2160p). These are all IPS panels and the fresh rates vary from 60Hz to 144Hz depending on the model you decide to pick up. The Nitro RG0 monitor, on the other hand, offers you just 2 display sizes – 23.8-inch and 27-inch – both with a Full HD(1080p) resolution. There is no refresh rate option here, you only get 75Hz with a 1ms response time. Both the VG0 and RG0 monitor come with the AMD Radeon FreeSync technology that provides gamers with a fast response time of up to 1ms, making for quite a smooth gaming experience if you have a compatible graphics card. You also get two 2W stereo speakers and a handful of ports in tow to connect a wide array of PCs. As for the pricing, the Acer Nitro VG0 monitors start at $129.99 and will become available next month, while the RG0 monitors will come to the US in July, starting at $169.99.